Old Glory, you wave proudly, without regard to danger, never do you discriminate from where you fly, always trusting, forever proud; you wrap yourself around the fallen, singing their last praises to the heavens. And so, with such honor bestowed upon our flag do we wonder what sentiments citizens minds contain. The flag has taken serious abuse in the name of freedom, dragged across the seas, shot at, shot down and still she climbed back up; she proudly flew over lands reclaimed for freedom sake; but the most abuse she gets is on the very soil she protects. Do we take these freedoms too lightly, thinking freedom a cheap commodity? A resurgence of patriotism seems a rising event, tea parties held on town greens displaying Old Glory proud and tall; from New England porches to southern sea side resorts, to mid-west ranches to the far western shore homes she waves at the dawn light and bids us adieu at dusk. 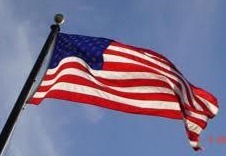 Glorious days, with only a trace billowy white, Old Glory reaches high to kiss the sky. What ever happened to the flag abusers of the sixties, in their tie-dyed shirts and worn out jeans, hugging to their hips, smoking and popping the latest drug; giving them a chance to find themselves, seek a higher vision of life. They took to the streets with Old Glory dragging behind, through the mud or dust of the street, threw her into a heap and tossed a match upon her. Their right of freedom of speech, said they could and they did. None knew the feeling of oppression, heavy on your soul, taking your very breath away; the spoiled little children of freedom’s land, complacent in their ways; freedom a cheap commodity. If they found themselves, of this I am not certain, wisdom of freedom, liberty and pursuit of happiness; seems lost forever, in the minds of the wretched spoiled sixties hippies now known as progressive liberals. From where they came they brought their children; demonstrations and anti-American rhetoric by day and safe beds of complacency by night. Is patriotism alive or dead; perhaps it is just asleep for some but very much alive in the once silent, majority making up the tea party movement. Today a patriot, proud to be free, took a walk on a maple lined street, past historic homes where men talked of the Revolution and where Washington encamped, a mile or two away; the Declaration of Independence, voted on in July. The patriot approached the village post office, there a package containing a very rare copy of the Declaration of Independence awaited him; people passed him on their hurried way to somewhere. He stopped, upon the ground, crumpled and dirty, Old Glory lay; yet Americans walked by her, on her and did not care; the patriot leaned down and in his arm he held her, in the other he held the package. Together, they walked past the old historic homes, Old Glory and the Declaration of Independence, both old and tattered, both still loved; by a patriot.